The Only 3-Diamond Hotel near the Grand Canyon, Just One Mile from the Grand Canyon South Rim Entrance. The Grand Hotel at the Grand Canyon is the only 3-diamond hotel in the region and one of the few area hotels with an indoor heated swimming pool and spa. Built in 1998, our luxurious hotel is just one mile from the south entrance to Grand Canyon National Park, with scenic South Rim of the Canyon just a short car ride away. Plus, guests receive a complimentary South Rim Walking Tour Brochure. The Grand Hotel at the Grand Canyon resembles a sprawling three-story chalet with the perfect blend of rustic and modern design. Our fully renovated guestrooms are bright, comfortable, and contain all the amenities that travelers desire. All guests of The Grand Hotel at The Grand Canyon are invited to use the indoor swimming pool, hot tub, and adjacent fitness center. Also, The Grand Hotel is a smoke-free environment. The Grand Hotel is one of the Grand Canyon hotels operated by Xanterra Travel Collection, the largest national parks concessioner in the U.S. You can learn of additional Grand Canyon hotels at Grand Canyon Railway Hotel and Grand Canyon National Park Lodges. Rustic Luxury at its Finest! If you get up early enough, you can see the sunrise over the Grand Canyon, or take a helicopter ride to some of the most remote places in the Canyon. We’ll help you plan hiking trips, geological tours, photo excursions, or find the best route for your ambitions. Even if you’ve seen it before, there’s always a new way to explore and enjoy this natural wonder. The Grand Hotel is located on State Highway 64, in the village of Tusayan, just one mile from the South Rim entrance to Grand Canyon National Park. 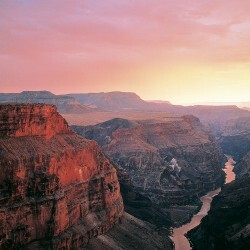 The hotel’s gateway location gives visitors unfettered access to all the Grand Canyon has to offer. The village of Tusayan also features attractions like the National Geographic IMAX Theatre and the Tusayan Trading Post for all your souvenir needs. The Grand Hotel features an indoor, climate-controlled swimming pool & hot tub as well as a fitness center. We also provide a business center in the lobby as well as complimentary Wi-Fi throughout the property. Our boutique gift shop features outdoor gear, and unique gifts, specializing in Native American jewelry and art. And, catch your favorite sports on the big screens in the Canyon Star Saloon.